"I am not just saying this, but I literally have never felt as beautiful as I have this past weekend. I was in absolute awe of your incredible skills and truth be told, I did not want to take it off at the end of the night!! The makeup lasted ALL night and was in pristine shape even after getting drizzled on, crying (but not the ugly cry...I tried to keep it together), through merengue and everything! So many of my family members have seen the photos on Instagram and Facebook and have already requested your services in the future!" Thank you so much! It was well worth the investment!!! I loved my makeup and my bridesmaids were so happy with how their makeup came out. I am so thankful and grateful that I was able to work with you. I promise you have a lifetime client! Thanks to you everyone looked stunning! My bridesmaids were raving about you. Thank you so much for your professionalism and just making our faces beat until the end of the night, dancing and sweating! It was amazing working with you. "I want to sincerely thank you and Dareshawn so much for being our makeup artists. Everyone loved their makeup and felt so beautiful!!! I was in love with my makeup and could not be happier of how it looked!! The contour is EVERYTHING and no matter how much we sweat, it lasted all day. My grandma and mom especially loved it!! They're the picky ones and everyone said their skin looked flawless, no one could even see their dark spots. People told my grandma she looked so young and that made her so happy!!! When I first saw your profile on Instagram over a year ago, I knew you were THE ONE :) Thank you for beating our faces and being so awesome!!! You were so professional and a joy to work with!! We will meet again for my brother's wedding one day! Till next time :)"
Jo Michelle gave me a natural yet bold look for my graduation. In my opinion, she is the best makeup artist in the Orlando area. Book her! You won't regret it. "My bridal makeup lasted through the night into the next day! You are so amazingly talented"
"You really are amazing at what you do. Our bride looked amazing, and any bride will be happy with your services for sure. "Thank you for making me feel and look like a queen! Hair and makeup are so important to any bride, and you delivered beyond my expectations. You made my day. So glad I met you and I cant wait to send you my wedding photos. Thank you!! We all loved our makeup and did not want to take it off! "Everything was perfect! Thank you so much again! "Thank you so much for making Crystal's wedding day EXTRA special. You are AMAZING! You have such a talent and are a beautiful person inside and out! I promise to spread the word about your awesome talent and services! "I woke up the next morning and my makeup was still in tact! I didn't want to wash my face. Thank you Jo! You did your assistant did an amazing job and I couldn't have asked for anything better. "Thank you so much for making us all look so beautiful on my Sissy's big day! Thank you for your patience. It was such a pleasure having you and your assistant present. You girls are efficient and professional. Thank you, Thank You, Thank you! I took makeup lessons from Jo Michelle in November 2015. Ever since then, my confidence has sky rocketed. I'm not afraid to open up and try new things now. Thank you for helping me believe in myself and my craft. You are definitely one in a million . Keep up the outstanding work. "​It was a pleasure working with Jo Michelle on the Mables Wedding! It makes total sense that she started off as a painter! Landon and I kept telling each other “Man, she's set up like she's about to paint a canvas, so focused and in her zone, in her element. It was awesome watching her work and create a masterpiece! Can’t wait to work with her again!" 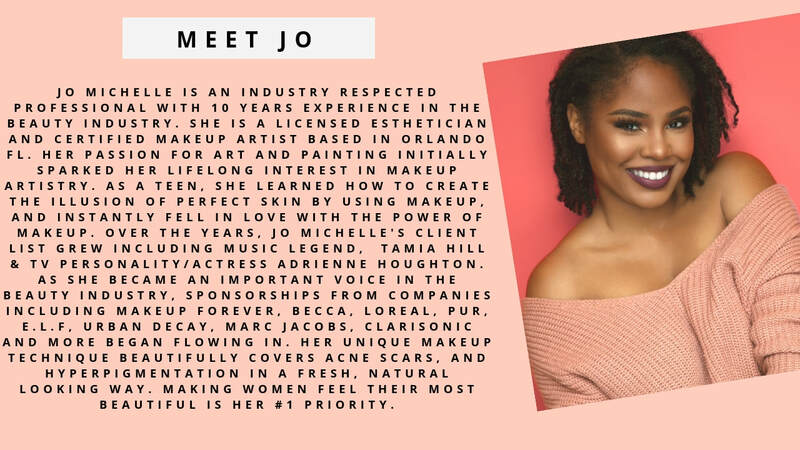 "What sets Jo Michelle apart is her attention to detail and her attention to LIGHTING (which as a photographer is very important). I won’t forget how taken in I was as I was shooting her work on the bride. Watching the transformation LIVE as I was filming was so amazing!" "Thank you for making me wedding day special. Our makeup was amazingly beautiful. When asked who did your makeup, I proudly say: “Jo Michelle”!" "Jo Michelle, thank you for being there for us! You and Dare did an amazing job. Everyone looked sooooo gorgeous! I hope you all had fun on the cruise! "I felt so beautiful today! Thanks so much for doing such a wonderful job. True professional. True talent." "Usually I feel unsatisfied when I'm about to wash off my makeup because I don't feel as though enough people saw me but not last night lol ...but OMG I got sooooo many compliments on my makeup last night it was unreal! Everybody loved your lashes! Thank you!" "Thanks again Jo! You made my pregnant face look amazing :)"
"When I say this girl is amazing, she is AMAZING! She has such an amazing spirit. I've have been going through so much for the last couple of months, not even my close ones even knew because I'd always cover it with a smile. She made me feel beautiful not only on the outside but also on the inside. She reminded me that my name is Charlene and to let it go because GODS got it and he is in control. This girl does not do this just for the money. She actually makes sure that she completes you and has you feeling good about yourself no matter what you’re going through! Thanks again hun, you're the best." "Thank you so much for making me and my girls look so beautiful! I had a beautiful wedding day with your help. Brides, book your date! You wont be disappointed!" "You did a great, I mean GREAT job on my girls. My husband cried when he saw me. Thank you, thank you THANK YOU for EVERYTHING!" "Thank you so much! It was an awesome experience to have with my baby girl. Jo, you made us both look and feel amazing. Most importantly, you made my baby girl feel like a beautiful princess. Every mom and daughter should have a glam day with you! THANK YOU!" "There are no words to express how beautiful I felt on my big day, and it was all thanks to Jo Michelle and Erwin! My bridesmaids contemplated sleeping in their makeup because they didn't want to take it off! The beat was real! I am so grateful that you two came and created these amazing looks for myself and the women I asked to stand by my side. You have a customer for life!" "Thank you Jo Michelle! Your passion is so evident in the way you took your time to make sure I looked amazing! Thanks for making my day special. Continue to follow your dreams and inspire all those around you. " "I was so happy and excited when my sister told me she booked a makeup artist for my bridal party. I loved how natural Jo Michelle's makeup looks were and I could not wait. Jo Michelle made my day so remarkable and perfect, I got compliments from everyone! You are the best! Thank you again for everything, I will definitely keep in touch with you on all my future events. We really appreciated everything. Good luck on all your future endeavors, and we wish you everlasting happiness!" "I was so stressed leading up to my hair and makeup appointment. Who would do it; when it would happen; would I like it? I LOVED my face and I'm happy I decided on you. My graduation shoot couldn't have been more perfect and I have you to thank for that. Thank you once again for taking the time to do it, for traveling, and being an all around joy throughout this process. Not only did I look like million bucks, but I felt like it as well. You have been blessed with such an amazing skill and an incredible gift. God is too great and will sometimes use the smallest things to make the biggest impact. "I had been admiring your work for quite some time now. I told myself that you have to do my makeup someday and definitely for my future wedding. I finally decided that I would just email you and ask you to do my makeup on my day off, and you did!!!! You did such a great job. I like how you took your time and didn't rush anything. I just admire your work a lot, and thank you so much for your time!! May God continue blessing you. " "Just wanted to say thanks again! I had a wonderful time during our bridal trial. I showed my bridesmaids, and they all said you did a wonderful job and definitely want you to do their makeup too! My fiancé liked it also (which is saying a lot because he normally doesn't like lashes or eye makeup). I was sad taking your makeup off lol! I now have a few hundred selfies stored in my phone. Thank you, and I'm so glad to have met you!" "Slayed, beat, and snatched (whatever you want to call it!) Can I just give credit where credit is due? Jo Michelle made me feel like a million bucks on my birthday! I could not get out of the mirror/camera. I got so many compliments and of course passed your name along. Thanks!" "I just wanted to reiterate how much I loved my face lol it was so simple yet grabbed so much attention. I appreciate you mostly because you listened. Most makeup artist or stylists do what they want even after the client have given clear instructions of what they want. You will go far. I don't know you much, but your spirit reveals your genuineness lol (is that a real word?) I trust that God will continue to enlarge your territory and take you places you'd never imagine. Continue to give 100%, the best is yet to come." "I love my makeup. Thank you so so much. Your work did me justice today!" "Thanks a million-and-one times for making me fab for my birthday weekend. Again, I slept with my makeup because I didn't want to take it off. I usually wash my makeup off but I couldn't ruin such a masterpiece! I appreciate you doing exactly what I wanted and you have a frequent client on your hands! You know how to make a girl feel beautiful." "I just drove back to Tampa, and my makeup is still flawless! I don't even want to wash my face. Thanks again for the one-on-one lesson. Money and time very well spent!"